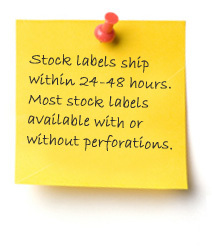 Adhere Label Products offers an extensive line of stock labels available for shipment within 24-48 hours after receipt of your order. We can ship from several stock warehouses throughout the United States! Premium coated thermal transfer paper ideal for high quality printing and bar-coding. Permanent adhesive designed for most common applications, including corrugated, shrink film and many other surfaces. With or Without Perforations Unless Noted. **Also available in a 2 across configuration. Standard Floodcoat colors including; white, clear, pink, orange, purple, red, brown and two shades of yellow, green and blue. No ribbon required. 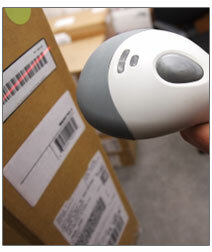 Premium direct thermal label face stock is ideal for barcodes and general purpose industrial applications. 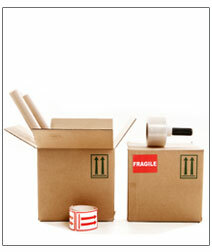 Permanent adhesive designed for most common applications, including corrugated, shrink film and many other surfaces. High quality laser paper specifically designed for table top laser printers, copiers, and inkjet printers. 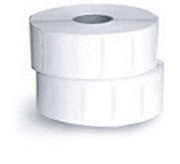 Labels are packaged 250 per package and 1000 sheets per case. 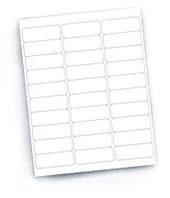 Minimum order quantity is 1M (M=1000) sheets.